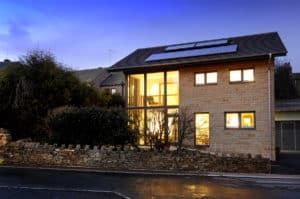 Award-winning Passivhaus firm Green Building Store has strongly criticised the recent Government decision to scrap the Zero Carbon Homes target, which was announced last Friday. Green Building Store is echoing criticisms that have been expressed by many in the industry, including the UK Green Building Council and Energy Saving Trust. The Bolster Moor based company is writing to its Colne Valley constituency MP Jason McCartney to express its strong concerns about the move. “For nearly 10 years the construction industry has been gearing towards the Zero Carbon target. Although it had been watered down a few times, at least it was giving the industry something to work towards and was helping the industry prepare for the forthcoming EU’s Near Zero Energy Buildings target coming into effect in 2021. Buildings account for 50% of total CO2 emissions in the UK: making them as energy efficient as possible is one of the most cost effective ways we have of reducing emissions. So, with the Paris UN climate summit only a few months away, and increasingly dire warnings from leading scientists on the risks posed by climate change, it is reckless to drop the Zero Carbon target at this time. Green Building Store is working with national bodies to lobby the Government for radical and urgent action on energy efficiency and low energy building. We have also signed (along with over 200 other companies and UK Green Building Council members) an open letter to the Chancellor calling for him to reconsider the decision.